Powers/Abilities: The Phantom Blonde possesses the normal human strength of a girl of her size, weight and build who engages in extensive regular exercises. She has no superhuman powers except for her wild, effervescent and exuberant personality. Weaknesses: The Phantom Blonde is weakened only by the parental guidance and domineering of her mother. History: (Sensational She-Hulk#21) - Wanda Mason was the daughter of 1940's detective gumshoe Mark Mason and Louise Grant, who had often assisted him secretly under her identity as the Blonde Phantom. In recent years, her mother became an associate of Jennifer Walters, the She-Hulk. During a visit home, Wanda discovered her mother missing and enlisted the She-Hulk's help in locating her. They traced her to Las Vegas, Nevada where Jasper Keaton of the American Purity Foundation was secretly holding her. Wanda and Jennifer eventually met with Keaton who then verified that he had Louise Mason kidnapped and that she was now in his custody. (Sensational She Hulk#22) - Wanda learned from Keaton that he wanted the atomic bomb that his underworld rival Dutch Rosenblatt had stolen in the late 1940's. Since it was one of the Blonde Phantom's unsolved cases, he had kidnapped Louise to learn its whereabouts. When the She-Hulk borrowed Reed Richards' time machine to go back in time to 1946 Las Vegas to look for it, Wanda tagged along for fun. Together, they found roles in the younger Dutch Rosenblatt's organization to help him steal the bomb in order to learn where he was going to hide it in the future. The two of them also clashed with the 1940's Blonde Phantom during her short stint with the All-Winners Squad while capturing the bomb and defeated the heroes in order to keep the past as intact as possible for sake of their present. (Sensational She Hulk#23) - Inspired by her mother's adventures in the past upon returning to the present, Wanda enlisted the help of Sue Richards in creating a costume out of unstable molecules that would allow her to follow in her mother's footsteps. Hoping to continue the legacy of her mother, she began calling herself the Phantom Blonde (a recurring error on the name of her mother's old identity). With this new identity, she actually became more of a distraction to the She-Hulk by accidentally disclosing the bomb's whereabouts to Keaton. As the She-Hulk fought both the Abominatrix and Captain Rectitude to keep the bomb from going off within Las Vegas, Wanda (as the Phantom Blonde) found and freed her mother and together they both went to prevent Keaton from killing Rosenblatt, whose pacemaker was the trigger to the bomb. Arriving on the scene, the Phantom Blonde lunged at Keaton to disarm him, but the gun then went off, hitting and destroying a window with one shot. Rosenblatt then keeled over from the strain to his heart which triggered his pacemaker and the trigger to the bomb. The bomb's timing mechanism started ticking just as the Abominatrix was threatening the She-Hulk with it during another brawl. Overpowering the Abominatrix quickly, the She-Hulk then tossed the live bomb as far from Las Vegas as she could get it where it would cause no damage. The bomb actually ended up destroying Keaton's isolated Nebuchadnezzer Palace outside the city. Realizing that he had lost everything, Keaton started contemplating suicide as the Phantom Blonde pulled him from the brink of death to deal with the authorities over his crimes. Realizing the thrill of her adventure, the Phantom Blonde then announced to her mother her desire to follow in her footsteeps, but her mother quickly put the kibosh on her daughter's dreams. (Sensational She Hulk#47 (fb)) - Barely hanging on to her costumed identity, Wanda once more became the Phantom Blonde in order to join her mother and the She-Hulk in investigating an Encroachiverse known as the Puppet-Verse opening up near Dekalo Street near New York City. Encountering the Master Puppet as he investigated their interference in his adopted world, the Phantom Blonde stood by and witnessed his defeat between the combined efforts of her mother and the She-Hulk. (Sensational She Hulk#29-30) - The Phantom Blonde flew with her mother and the She-Hulk to consult Professor Ivan Sanderson on why random superheroes and villains were appearing and vanishing over the city from out of space and time. They were unaware he was actually the criminal scientist Isbisa and that his class playing with his equipment designed to break the fundamental fourth wall of trans-dimensional physics was causing the appearances and disappearances. As they talked, Spider-Man was yanked from his point in time from a fight with the Hobgoblin and accidentally webbed up Isbisa, Louise and the Phantom Blonde in the office. As they waited for the webbing to dissolve, Louise guessed Sanderson was Isbisa, as her daughter the Phantom Blonde lamented not catching on sooner. His chance for a peaceful retirement ruined, Isbisa then vanished by way of hidden devices on his person. (Civil War: Battle Damage Report) - Tony Stark considered Wanda as a potential Initiative recruit. Comments: Created by Steve Gerber, Buzz Dixon, Tom Artis and Jim Sanders III. The name of the Phantom Blonde's brother comes solely from the OHOTMU Update 89's entry on Louise Mason. He has not been seen or mentioned in the Marvel Universe. Her grandfather's name, however, changes from Walter (in Sensational She-Hulk#22) to Charles (in Sensational She-Hulk#23). Despite her lack of significant potential, it would be interesting to see the Phantom Blonde appear as a recurring character in either connection with the New Warriors or the Thunderbolts. Her character and costume is a lot like watching Britney Spears playing an Amalgam Earth version of Boom-Boom (Tabitha Smith) and DC Comics' Black Canary (Dinah Lance). 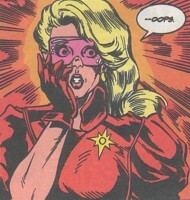 The Phantom Blonde is not the only wanna-be costumed hero who tried to be the She-Hulk's sidekick. Marvel Comics' Tommy the intern also tried it with an animal costume as the Gopher. Although the story involving the Puppet-verse occurs in Sensational She-Hulk#47 (in the middle of the She-Hulk's encounter with the Carbon Copy Men), it actually occurs chronologically between issues #26 and #27 since #26 promises a story on puppets, but actually went on to do a story on Dragon Man, the Grey Gargoyle and the appearance of Surge the Dragon Killer in #27. One can assume the story ran late and had to be replaced and then was used as filler when part of the story on the Carbon-Copy Men ran late. The Blonde Phantom's stint with the All-Winners Squad occurs in 1946 during its post-war activities. One other observation: after the She-Hulk and Louise Mason destroy Dutch Rosenblatt's window to his penthouse, he suddenly has a vague recollection of another green-skinned "shiksa" he once met. Since this is a recollection of the She-Hulk when she was in 1946 helping him to steal the atomic bomb BEFORE the She-Hulk had traveled back in time, it might mean that the She-Hulk and Wanda's trip in time was already ensconced and predetermined in the timestream before her decision to use Reed's time machine.